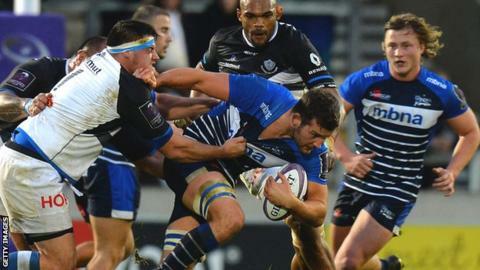 Sale Sharks finished strongly to beat Castres and boost their European Challenge Cup quarter-final hopes. Joe Ford, retaining kicking duties with England international Danny Cipriani on the bench, put Sale 9-0 up at the break with three penalties. Johnnie Beattie's try and Julien Dumora penalty gave Castres hope, but second-half Vili Fihaki, Neil Briggs and Johnny Leota scores ensured Sale's win. Victory saw Sale briefly top Pool 2 but Dragons won in Pau to resume top spot. Despite making a host of changes, Steve Diamond's side have consolidated their hopes of progressing in Europe after losing their competition opener this season against Newport. Both teams struggled with greasy, wet conditions in the first half, with numerous handling errors costing them of possession in promising field positions. Ford's boot was the difference before the interval, while Castres finished the half with 14 men following Alexandre Bias' yellow card. Fihaki and Briggs grabbed tries either side of Beattie's effort, which moved the French side to within six points with 20 minutes remaining. But with the visitors a man down again following Christophe Samson's yellow card, Cipriani added a penalty and converted Leota's late effort to seal the win. Sale: Arscott; Brady, Leota, Jennings, Ingall; Ford, Mitchell; Lewis-Roberts, Taylor, Cobilas; Mills, Ostrikov, Easter, Seymour (capt), Fihaki. Replacements: Briggs, Flynn, Harrison, Beaumont, Neild, Stringer, Cipriani, Haley. Castres: Palis; Smith, Vialelle, Lamerat, Martial; Dumora, Dupont; Tichit, Rallier, Wihongi; Samson, Moreaux, Diarra, Bias, Beattie. Replacements: Beziat, Taumoepeau, Montes, Desroche, Tulou, Sivivatu, Combezou, Seron.